This is going to be a guided tour through some example code I wrote to illustrate the usage of the Markov Functional and Gsr (a.k.a. Hull White) model implementations. Hull White / Gsr is without any doubt the bread and butter model for rates. It calibrates to a given series of vanilla instruments, it has a parameter (the mean reversion) to control intertemporal correlations (which is important both for bermudan pricing and time travelling), but you can not alter its “factory settings” regarding the smile. At least it is not flat but a skew. Not unrealistic from a qualitative standpoint, but you would have to be lucky to match the market skew decently of course. Markov Functional on the other hand mimics any given smile termstructure exactly as long as it is arbitrage free. Recently I added Hagan’s internal adjusters to the Gsr implementation, trying to make up for the comparative disadvantage. I coming back to them at the end of this article. Internal adjusters here is in distinction to external adjusters of course, which I am working on as well. More on them later. Let’s delve into the example. I do not reproduce the whole code here, just the main points of interest. You can find the full example in one of the recent releases of QuantLib under Examples / Gaussian1dModels. First we set the global evaluation date. The rate curves will be flat, but we assume basis spreads to demonstrate that the models can handle them in a decent way. Now we set up a deal that we can price later on. The underlying is a standard vanilla spot starting swap with fixed rate against Euribor 6M. Of course there is a reason that we use a NonstandardSwap instead of a VanillaSwap. You will see later. We define a bermudan swaption on that underlying with yearly exercise dates, where the notification of a call should be given two TARGET days before the next accrual start period. The reversion speed is as well. And we are ready to define the model! Normally it is enough to pass the model gsr. The and are the default parameters for the numerical integration scheme that is used by the engine as well as true and false indicating that the payoff should be extrapolated outside the integration domain in a non-flat manner (this is not really important here). 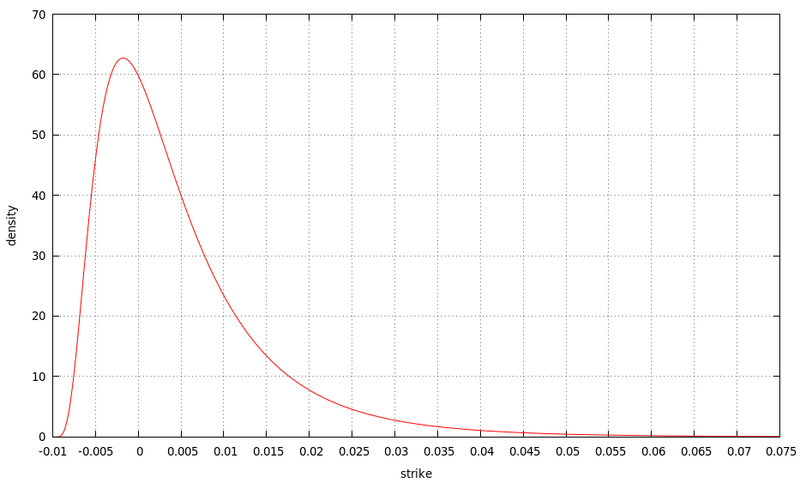 The last parameter denotes the discounting curve that should be used for the swaption valuation. Note that this is different from the model’s “main” yield curve, which is the Eurior 6M forward curve (see above). We set up a second engine for our instrument we want to price. On top of the parameters from above, we have an empty quote here. This can be used to introduce a flat credit termstructure into the pricing. We will see later how to use this in exotic bond valuations. For the moment it is just empty, so ignored. to get a coterminal basket of at the money swaptions fitting the date schedules of our deal. The swapBase here encodes the conventions for standard market instruments. The last parameter Naive tells the engine just to take the exercise dates of the deal and the maturity date of the underlying and create at the money swaptions from it using the standard market conventions. We can do more involved things and we will below: as soon as the deal specifics are not matching the standard market swaption conventions, we can choose an adjusted basket of calibration instruments! This can be a little thing like five instead of two notification dates for a call, different day count conventions on the legs, a non-yearly fixed leg payment frequency, or bigger things like a different Euribor index, an amortizing notional schedule and so on. I wrote a short note some time ago on this which you can get here if you are interested. where method and ec are an optimization method (Levenberg-Marquardt in our case) and end criteria for the optimization. I should note that the calibration method is not the default one defined in CalibratedModel, which does a global optimization on all instruments, but a serialized version calibrating one step of the sigma function to one instrument at a time, which is much faster. Here is the result of the calibration. with the parameter MaturityStrikeByDeltaGamma indicating that the market swaptions for calibration are chosen from the set of all possible market swaptions (defined by the swapBase, remember ?) by an optimization of the nominal, strike and maturity as the remaining free parameters such that the zeroth, first and second order derivatives of the exotic’s underlying by the model’s state variable (evaluated at some suitable central point) are matched. To put it differently, per expiry we seek a market underlying that in all states of the world (here for all values of the state variable of our model) has the same value as the exotic underlying we wish to price. To get this we match the Taylor expansions up to order two of our exotic and market underlying. As you can see the calibrated rate for the market swaption is as expected. What you can also see is that payer swaptions were generated. This is because always out of the money options are chosen to be calibration instruments for the usual reason. The nominal is slightly different from , but practically did not change. This is more to prove that some numerical procedure worked for you here. almost doubled from to basispoints. Well actually it more than doubled. Whatever. Puzzle: We did not define a smile for our market swaption surface. So it shouldn’t matter which strike we choose for the calibration instrument, should it ? First of all, the nominal of the swaptions is adjusted to the amortizing schedule, being some average over the coming periods respectively. Furthermore, the effective maturity is reduced. As a side note. The nominal is of course not relevant at all for the calibration step. It does not matter, if you calibrate to a swaption with nominal or or . But it is a nice piece of information as in the last example anyhow, to see if it is plausible what happens. Now consider a callable bond. You can set this up as a swap, too, with one zero leg and final notional exchange. The NonStandardSwap allows for all this. The exercise has to be extended to carry a rebate payment reflecting the notional reimbursement in case of exercise. This is handled by the RebatedExercise extension. The delta-gamma calibration basket now looks as follows. The notionals are slightly below (as well as the maturities and strikes not exactly matching the bermudan swaption case). This is expected however, since the market swaptions are discounted on OIS level, while for the bond we chose to use the 6m curve as a benchmark discounting curve. The effect is small however. Put 6m as discounting to cross check this. Look what the rate is doing. It is adjusted by roughly the credit spread. Again this is natural, since the hedge swaption for the bond’s call right would have roughly basispoints margin on the float side. Here it is coming automatically out of our optimization procedure. Let’s come to our final example. The underlying is a swap exchanging a CMS10y rate against Euribor 6M. To make the numbers a bit nicer I changed the original example code to include a basispoint margin on the Euribor leg. is basispoints. Please note that the option has its first exercise in one year time, so the first year’s coupons are not included in the exercised into deal. This is why the underlying price is higher than the option value. The underlying is now matched much better than in the Gsr model, it is up to basispoints accurate. A perfect match is not expected from theory, because the dynamics of the linear TSR model is not the same as in the Markov model, of course. The option price, accordingly, is around basispoints lower compared to the Gsr model. This is around the same magnitude of the underlying mismatch in the Gsr model. The exotic underlying is actually well matched by a market swaption’s underlying around the model’s state , which is the expansion point for the method, so it does what it is supposed to do. But the global match is poor, so there does not seem to be a good reason to include additional swaptions into the calibration to represent call rights. They do not hurt, but do not specifically represent the call rights, so just add some more market information to the model. I am not going into details about the volatility function here, but note, that the first step is fixed (at its initial value of ) and the step after the last expiry date matters. In addition a global calibration to all coterminals simultaneously is necessary, the iterative approach will not work for the model. There is one last thing I want to mention and which is not yet part of the library or the example code. Hagan introduced a technique called “internal adjusters” to make the Gsr model work in situations like the one we have here, namely that the underlying is not matched well. He mentions this approach in his paper on callable range accrual notes where he uses his LGM (same as Gsr or Hull White) model for pricing and observes that he does not calibrate to underlying Libor caplets or floorlets very well. He suggests to introduce an adjusting factor to be multiplied with the model volatility in case we are evaluating such a caplet or floorlet during the pricing of the exotic. So the missing model fit is compensated by using a modified model volatility “when needed” (and only then, i.e. when evaluating the exotic coupon we want to match). This sounds like a dirty trick, destroying the model in a way and introducing arbitrage. On the other hand mispricing the market vanillas introduces arbitrage in a much more obvious and undesirable way. So why not. If Pat Hagan says we can do it, it is safe I guess. We should say however that Hagan’s original application was restricted to adjust Libor volatilities. Here we make up for a completely wrong model smile. And we could even go a step further and match e.g. 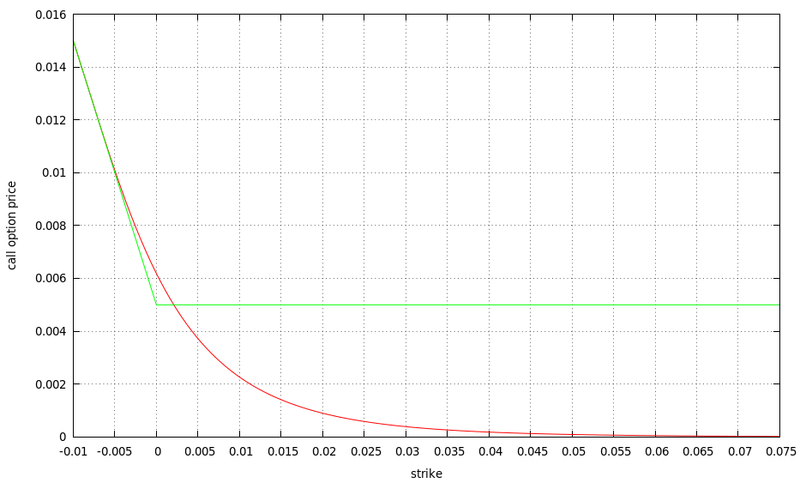 market CMS spread coupon prices in a Gsr model, although the model does not even allow for rate decorrelation. So one should be careful, how far one wants to go with this trick. The prices here are with reference to a notional of one hundred million. The adjuster values needed to match the reference prices from the replication pricer are not too far from one, which is good, because it means that the model is not bent too much in order to produce the CMS coupon prices. The underlying match is (by construction) very good thanks to the adjusters. 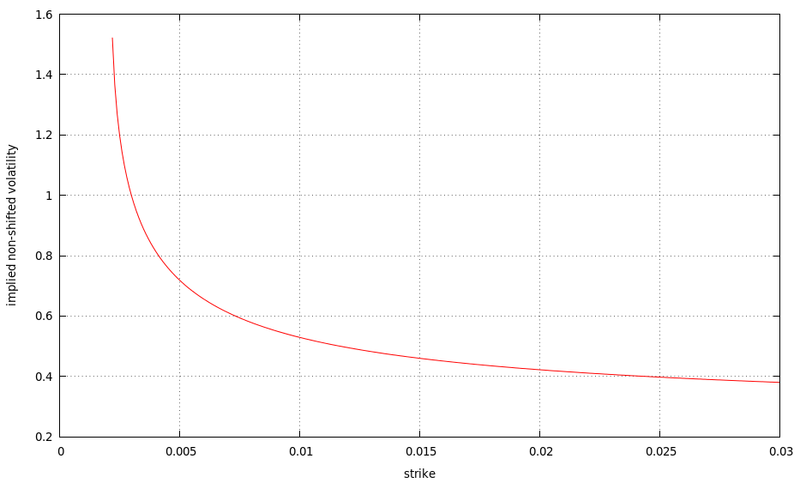 Also the option value is adjusted down as desired, we are now very close to the markov model’s value. Needless to say that this does not work out that well all the time. Also as an important disclaimer, an option on CMS10Y against Euribor6M has features of a spread option, which is highly correlation sensitive. Neither the (adjusted) Gsr nor the Markov model can produce correlations other than one for the spread components, so they will always underprice the option in this sense. Enough for today, look at the example and play around with the code. Or read the paper. Puzzle: Where is this snippet taken from ? Anyway, financial markets do not care. We currently have negative Euribor Fixings for 1w and 2w. Brokers started to quote zero strike floors on Euribor 3M and 6M already a year ago or so. Now, market participants start to assign significant premia to zero strike floors on the EUR CMS 10y rate. with a positive (or of course zero) shift . For EUR caps and floors is a common value currently. It is quite simple to give a solution of such a shifted model in terms of the original model: Set , then you have the original model back, but in instead of . So to get an option price, plug in the shifted forward and the shifted strike into the original option pricing formula. The model sets the lower bound for the underlying rate to . One can ask what the classic (i.e. non-shifted) Black76 implied volatility for option prices produced by our shifted model is. Here you go. The shift parameter has produced a skew. Actually shifted underlyings have been a popular technique to produce skews, e.g. in the Libor market model, for a long time. Here our motivation is different, namely to produce negative rates. starting at which is the sum of the forward and the shift and crossing the y axis (not very prominent in this plot) above the forward level because of its convexity, thus producing non-attainable prices for the non-shifted Black model. The green line marks the maximum price attainable in a non-shifted Black76 model. I should say that I am always talking about non discounted prices – the discount or in case of swaptions the annuity factor is unity. with and and our shift . Here is a density with same parameters as above and . The negative density for strikes near is nothing special, we already know this defect from the classic non-shifted Hagan model (we are using the standard expansion from 2002 here). The point is again that the density now covers the region from to zero strike level. It seems that brokers like ICAP changed their primary model for swaption smiles to this one. They publish an ATM matrix together with a shift matrix assigning an individual shift to each option tenor / swap length pair. The shifts are constant across option tenors, but different for the different underlyings. At the moment the shifts are for the 1y underlying, going down to for the 30y underlying. They also publish smile spreads in the usual way, but as differences of shifted lognormal itm or otm volatilities and the shifted atm volatility. In QuantLib we need to do several things to adopt these new quotation standards. I will try to package the changes into a pull request soon. The highlights are as follows. The Smile Section class needs to know what kind of volatility nature it represents. The ATM matrix now takes a shift matrix as an optional parameter. The two swaption volatility cubes need to be adapted as well. Their interface does not change, but we have to use a shifted SABR model for the SABR cube for example. 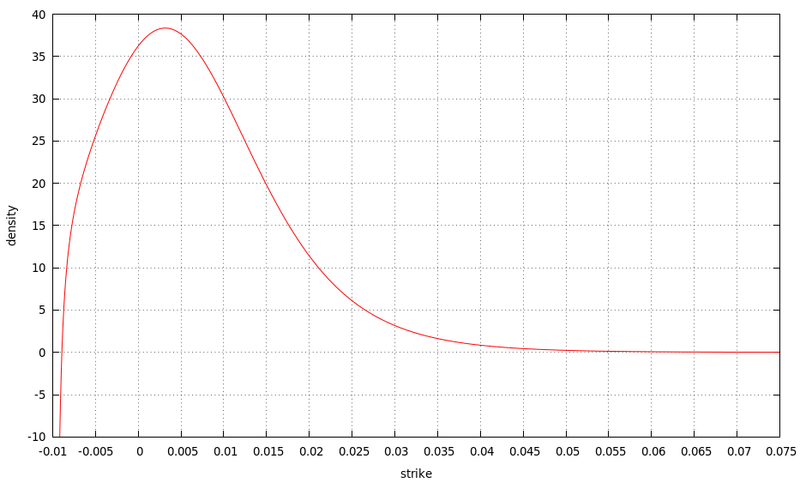 Also the moneyness definition for smile spread interpolation has to be adapted. And some other things I guess. with begin the fixing date of the coupon, and prices of market receiver and payer swaptions and weights This nice and concise derivation is taken from the three volume Piterbarg bible on interest rate derivatives. The linear terminal swap rate model is given by a linear function . is determined by a no arbitrage condition already, but is free, and can for example be linked to a one factor mean reversion. Or just set as a free user choice directly. The derivation says that you should integrate over the range where you have non zero put or call prices. For a shifted lognormal smile section input this means that we need to integrate over for a plain CMS coupon, if is the shift. The shift can be read from the SmileSection which is input to the CMS coupon pricers and we are done. The last thing I did so far is to make the Markov Functional Model work with the shifted smile sections. The result is a fully dynamic and consistent model which can reproduce densities given by marginal shifted SABR inputs for example. This way we get consistent with the TSR CMS pricing described above. Enough for today, I will go into more details about the Markov functional model (and the linear TSR pricer) in one of the next posts.